Fiber prep is a big part of the process. There’s a lot to be said for prepping and blending my own batts. Yes, purchasing prepared fiber is a lot less work and has that whole instant gratification thing going on. 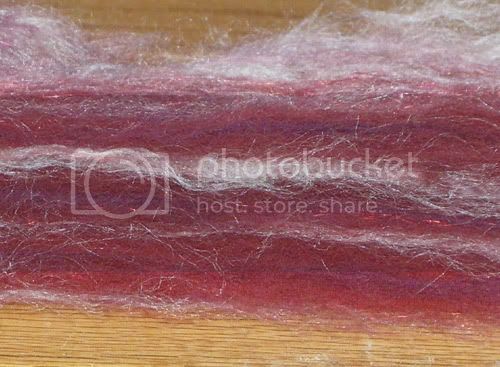 Doing it myself, however, ensures that I get exactly what I want – in this case sparkly, elaborate, deep red batts. ‘Cause I need to have more color in my life according to some people. Another consideration is the quality of the fiber prep. My hand combed and hand carded stuff is far superior to the majority of what I can buy. 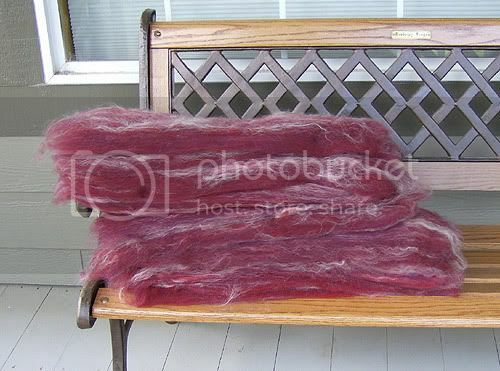 I can only think of 2 places who’s fiber is as nice as what I create. If they would only do handcombing I wouldn’t have to waste my spinning time ;) There really is something to be said for good craftsmanship and the personal touch. Not to mention there’s a certain satisfaction to doing all the steps of a project from start to finish. The beautiful red and purple rovings I dyed over the 4th of July have taken the next step in their transformation. All that plain white wool and silk has become something much more interesting and fun. The handle on this blend is as appealing as the colors. 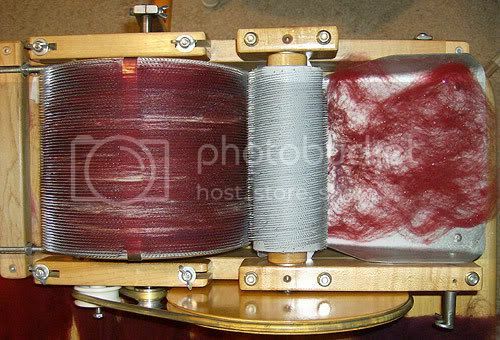 My first step when I’m making multicolored or multifiber batts is to run the individual colors or fibers through my trusty Patrick Green carder. 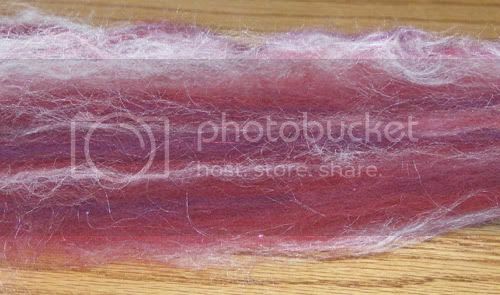 This opens up the fibers, blends the dyeing varigation on each batt a bit, and generally makes it much easier to break up for blending. This is the first pass through the carder. Have I mentioned how much I adore my PG? It’s such a great tool. I just bought the carder some new belts and a batt lifter to keep her happy. I cannot imagine trying to do this 16 + ounce project on hand cards! 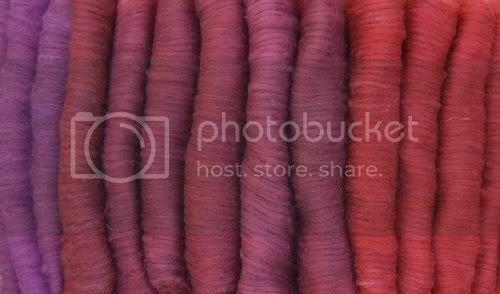 Here are most of my intermediate merino batts. 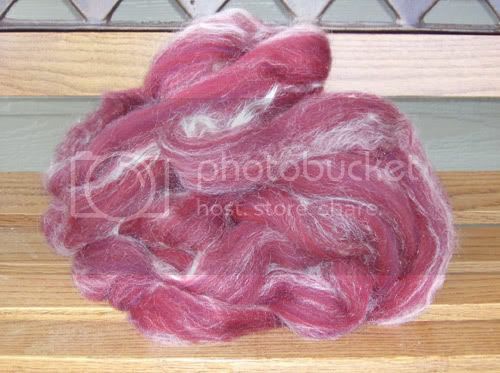 The colors are rich and fabulous – I’m very pleased with how this dye session turned out. Even with the blending at this stage, the batts show a nice depth and breadth of color. These are far more complex than the plain dyed roving purchased at the LYS. 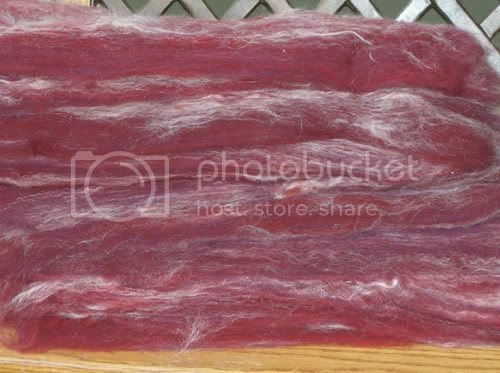 From this state I can strip down what I need for each blended batt, fluff it up a bit, and easily run it through the carder. Looking at them together, it would seem that I would end up with purple batts. Thankfully that’s not the case, as purple is sooo not me. This gorgeous batt is the final result. Ohhh, pretty, shiny! I ended up with little more than a pound of this blend in 9 big batts. Way more than I need. No big surprise, it always seems to end up that way. I figure I only need 9 – 10 ounces for a reasonable project. That depends on how I end up spinning the yarn. I’ve been sampling it, but haven’t hit the sweet spot yet. It looks like a veritable mountain of fiber here. 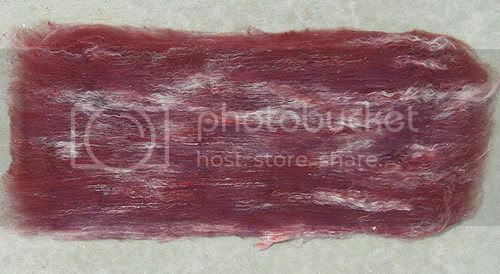 This is the geologic view of a stripped batt. You can see the different layers of color and fiber that I applied as I went. The final roving turned out very nicely. It’s more of a deep red than the picture in the bright sunlight shows. 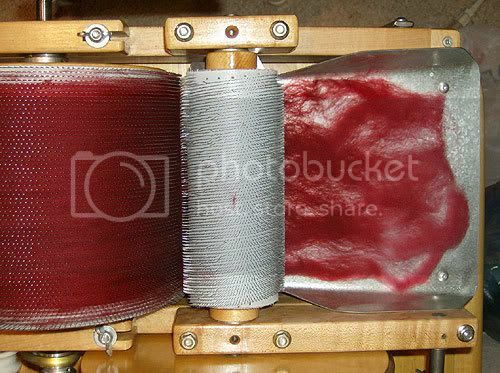 The deep red is much closer to the color in the drumcarder pics. Pulling the roving blends the fiber even further. The color striping ends up being pretty subtle, but that Angelina stands out far more than it shows in the pictures. I’m delighted with how this has turned out so far. The question is what does it want to be? Merino / silk has so much potential, it’s a very versatile blend. So far this roving is happy being anything from laceweight (~20 wpi) to sportweight. I haven’t gotten up to the thicker weights yet, though I’m sure it will work. It’s going to be a smooth yarn, probably 2 ply. More worsted than woolen due to the prep. The sparkliness does limit some of the possibilities. Scarf would be a safe bet. I, however, only need 1 sparkly, red scarf. I wonder if there are any shawls out there that would work for this? This yarn is far beyond what I normally make for myself, so I’m not as familiar with what it could be. Decisions, decisions. That turned out beautifully. Do you sell any of your extra? Oh, and I hope you don't mind me stalking you via spinningfiber! I've been considering selling some of this stuff, along with my beaded yarns. Maybe later this summer / fall. Thanks for dropping by. I hope you found some of the things here useful.